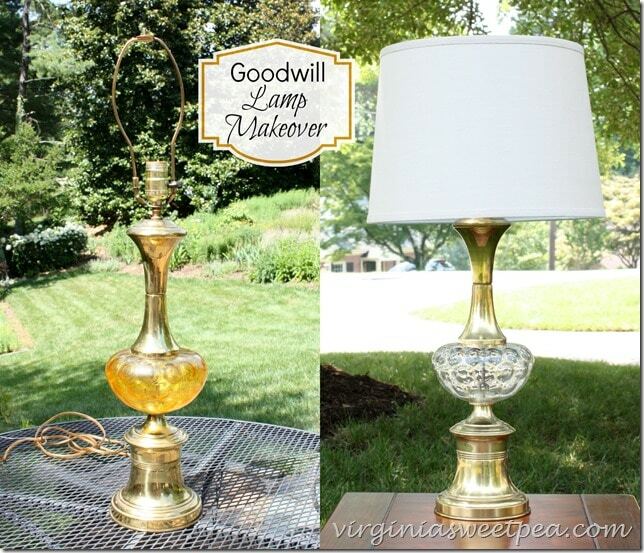 I’ve got two makeover to share today: a Goodwill lamp and Cargo end tables. 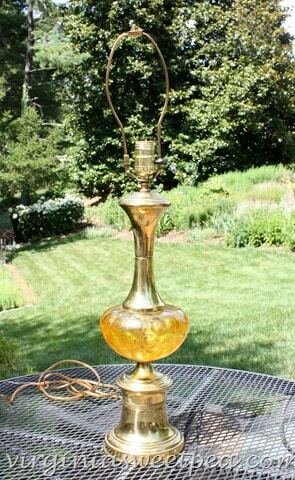 The lamp is my favorite, so let’s start there. 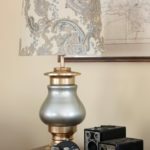 A few weeks ago my mom and I stopped at a Goodwill where I spotted a lamp that I really liked. My mom thinks that it is from the 1960’s, but you never know when something is purchased from Goodwill. Funny story: I went to the counter to pay for this and two other things and they rang up to less than $15. I realized that I had no money and had to call my mom over to pay for them. We both laughed that a 46 year old still needs her mom to pay for things from time to time! I cleaned the “brass” part of the lamp with a damp magic eraser and it immediately looked nice. I then realized that the amber part was paint over glass and that the amber came off with a little bit of magic eraser elbow grease. I got lucky and found a shade that I liked at Lowe’s for $20.00. Since the cord and plug were old, I rewired the lamp for safety. 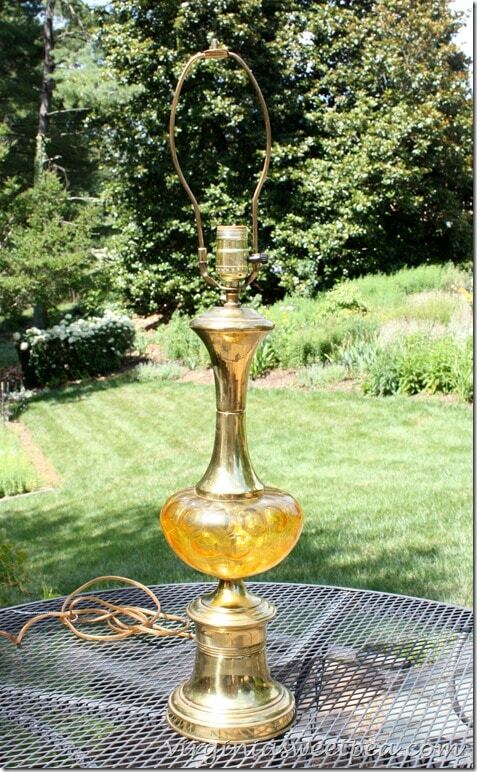 For a $35 investment, I now have a new-to-me lamp that I really like. 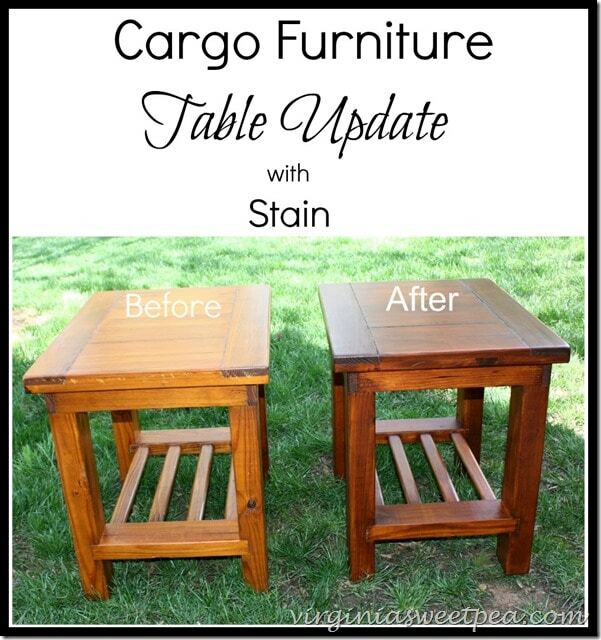 The second makeover I’m sharing today is the staining of a pair of Cargo end tables that Mr. SP purchased at the mall when he first arrived to town in 1986. Mr. SP stained them in his apartment (can you imagine the smell) where they were used until he bought our house in 1992. 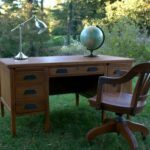 They were moved to our house and have been family room end tables until we replaced them with my parents’ late 1960’s end tables in April. Years of use resulted in a few knicks here and there and a dull finish. 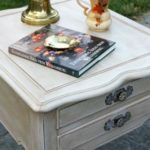 As an experiment, I rubbed General Finishes stain in Mahogany over one of the tables to see if it would take the stain. you can see below that my experiment worked like a charm. I also sealed the stain with GF’s topcoat. 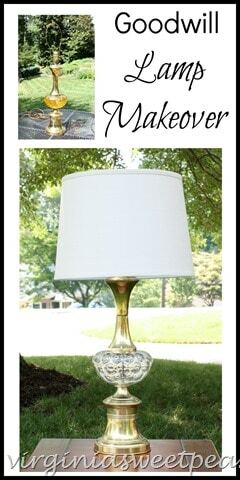 I’m liking my 1960’s lamp paired with one of our 1980’s end tables. Another funny story: I sometimes forget that I’m getting old. My friend Megan of Rhappsody in Rooms was at my house a few months ago and saw these tables in our basement. I started chatting about them and said, “Don’t you remember how every mall had a Cargo or a This End Up store?” Megan gave me a blank look and I realized that at 20 something Megan had no idea what I was talking about. Cargo had long left our mall long before Megan was born! These end tables will be used at the lake when our house is complete. Speaking of the lake, I hope to have a house update soon. There was no progress last week because of the holiday but something should happen this week, hopefully a basement floor. If you liked this post, I would love it if you would pin it for others to enjoy. Please tell me I’m not the only one who remember Cargo and This End Up at the mall! HAHAHAHA! I just burst out laughing. I’m famous! I got a mention. That story is sooo funny. I apologize for my blank look. 🙂 Plus, you are not getting old. 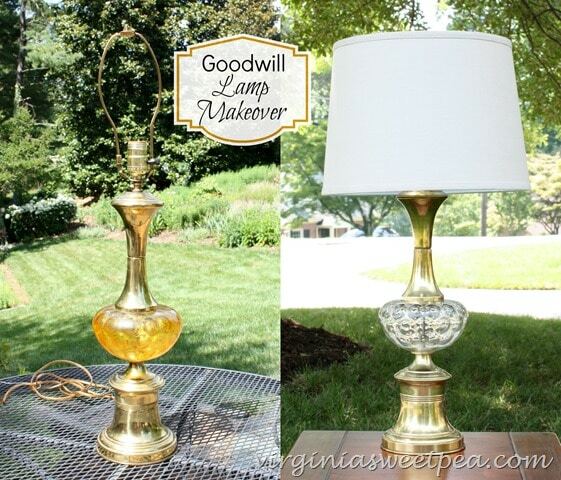 Anyways, back to the makeovers, I’m so impressed with that lamp. It looks awesome! That is crazy that the glass part was painted. It looks so much better clear! 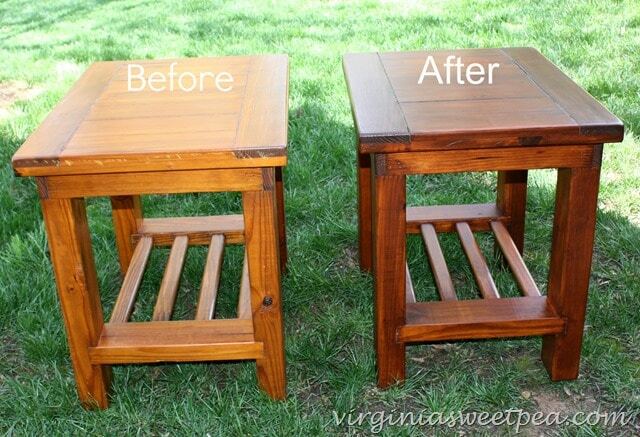 The tables look great newly stained and I can’t wait to see them in their new home sometime in the future!! Yes! I remember This End Up at the mall. 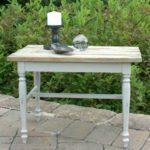 I didn’t particularly like all that rough wood back then but your tables are gorgeous. I’ve never heard of Cargo, but I will tell you the new finish is beautiful. 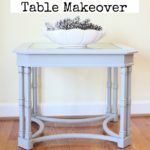 (Pls don’t dismay, BUT I like these refinished tables better than the ones from your Mom.) I love refurbished/refinished furniture and you can’t beat that solid wood! I took a look at your lake property. What a wonderful place for a holiday. I remember Cargo. 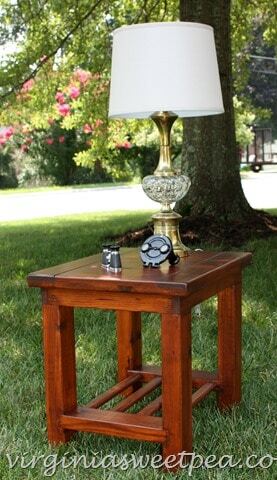 The side tables are classics. 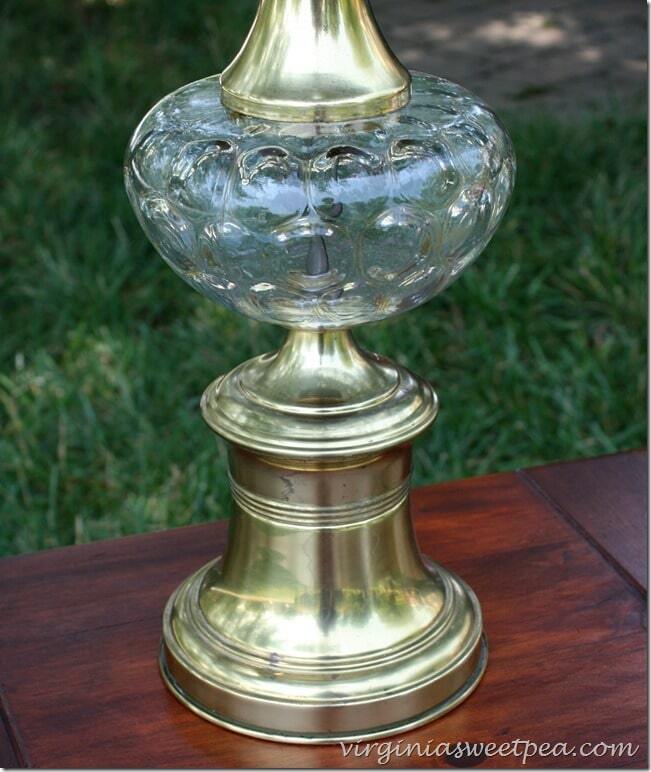 Interesting that the amber coating on the lamp cleaned off. Good update. I think I have to learn how to rewire lamps, I have so many old ones and they all need rewiring. Your lamp turned out great. 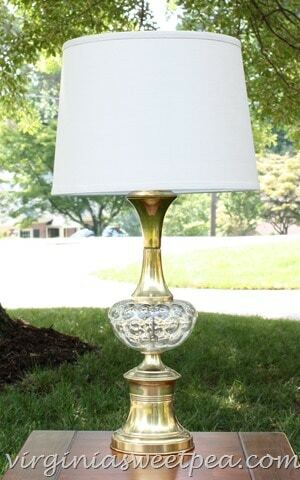 I don’t think I would have looked at that lamp and thought, I could make this look great. Thanks for sharing and showing your creativity. Ha ha I remember we had a This End Up in every mall! 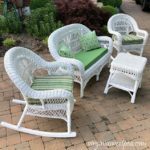 As you soon as you mentioned that your hubby bought these at the mall, I knew where he purchased them, although it does seem weird to imagine that store in the mall now! 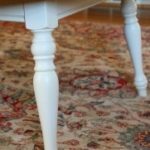 The GF stain really made the finish so rich and pretty. And who knew that orange would rub off the lamp like that? I might not be so quick to pass those pieces up now, it’s beautiful! Great job! 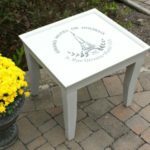 The table really pops now. I tend to lean to darker stuff myself. Your lamp turned out looking so pretty! !